A hardy, rich, garlicky, medium Porcelain hardneck garlic. Polish Jenn Grows well in most states even in Warm Winter Areas but will be marginal at best in most of Florida and south Texas. Polish Jenn is a large, beautiful and well-formed porcelain garlic similar to Northern White. Its flavor is deep and musky and it has a rich mellowness that sticks around for a long time. 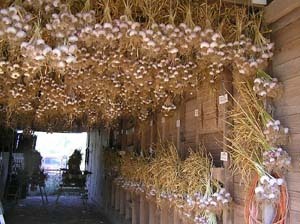 Good rich medium flavored long storing garlic. From a grower's perspective, it is a tall dark green plant and is a very good survivor, usually grows healthy and appears to be somewhat resistant to many of the diseases that can affect garlic. It obviously came from Poland and it likes cold weather and can get quite large in good growing conditions.